When purchasing a dwelling buyers typically obtain a bank loan then purchase the dwelling with the loan funds. The borrower repays the loan in instalments. The bank secures their money by having a mortgage over the property. The borrower has a title to the dwelling. When a bank creates a loan the money created has interest attached to it. As repayments are made the interest is paid first then anything remaining is paid off the capital. This approach causes the cost to buyers to be higher than necessary and to be loosely related to the rental value of the dwelling. An alternative approach to loans is Rent and Buy. With rent and buy the buyer pays off the capital in instalments, much like the repayments of a loan, and at the same time, accumulates a rent debt. After the capital is repaid the rental debt is paid. With Rent and Buy a trust is established to hold the mortgage and the title to the dwelling. Both the buyer and the provider of capital have a share in the dwelling. With bank loans, the amount the buyer will pay is related more to the interest rate and the difference between interest payments and repayments – both of which are difficult to estimate. When the rent and buy approach is adopted, the financial cost of buying a dwelling is directly related to its rental value which is a stable, known value. The buyer will always pay less with rent and buy compared to a traditional loan regardless of whether the loan is supplied by a bank or directly via the seller. Most purchases of dwellings are financed through loans because there are few alternatives for most people. However, there are investors and potential investors who have cash – such as superannuation funds or landlords who own properties – who will be attracted to this system because they are in the business of investing funds to get a secure inflation resistant future return. By using the rent and buy approach such investors will get a higher return than through simple purchase and rent. This is because many of the costs of rental are shifted to the renter. With a normal rental, the owner of the property is responsible for the maintenance and running costs of the asset. Under rent and buy the renter becomes responsible for these costs. This means that the saver gets a higher return on their investment because they do not have to cover many of the costs that landlords normally incur. Let us assume a person has a dwelling they wish to sell and the person has no mortgages or encumbrances on the dwelling. They find a renter who is willing to pay the price of the home and to pay it regularly as rent. The title to the property transfers to a trustee who will ensure that both parties will honour the agreement which is in the form of a mortgage. Title remains with the trustee. Whilever they buyer pays rent they and the saver have shared ownership of the mortgage. The buyer lives in the property and is responsible for all running costs, insurances and maintenance. If either buyer or seller spends money on the property, they can ask a third party to rule on the impact on the rental value of the dwelling. If it has increased the value, the increase is added to the equity of the party that spent the money. Also, if the rental value of the property increases, the rent paid on the remaining unpaid equity can increase. Either the renter or seller can sell their part of the mortgage. The rules are that if a buyer is living in the dwelling, then they can only sell to another buyer who will live in the dwelling. Renters can choose to vacate the dwelling and cease to make repayments. In this case, all the rent owed to the seller is added to the seller’s equity. The equity of the renter remains with the dwelling and the renter now becomes a seller. If a renter cannot meet the repayments then the seller has the right to find another renter and to force the previous renter to vacate the dwelling. However, while-ever the renter can meet their repayments, they cannot be forced to vacate. The problem for buyers is illustrated in this graph and in the spreadsheet “Loans versus rent and buy” which is available on request. 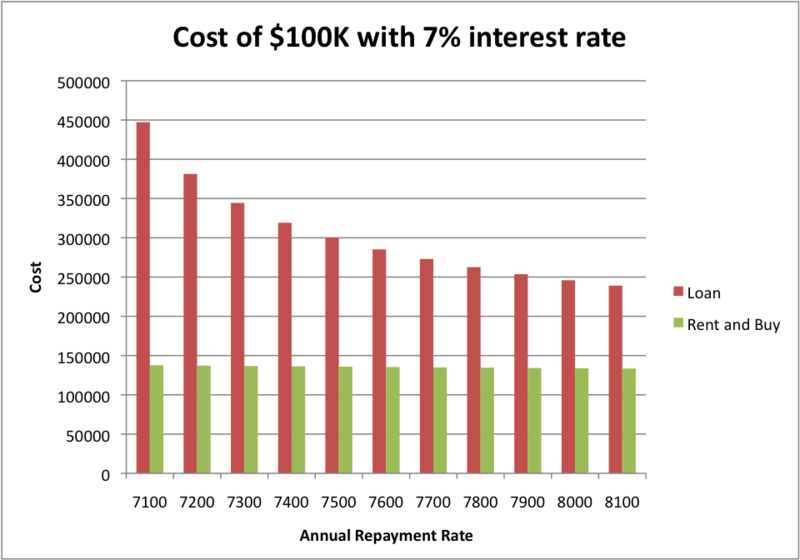 Here the effect of small variations in the repayment rate shows a dramatic difference in the cost of buying a dwelling of value $100K. Rent and buy costs change linearly if the rental prices are increased linearly whereas loan costs do not vary linearly with repayment rates and interest expense. Buyers purchasing with rent and buy can make better choices when buying a dwelling because they will know the final cost of the dwelling. The Spreadsheet, available on request, titled “Renting with rent and buy” has the following assumptions. The rental rate is related to the actual rental value of a property. The tax rate is 30% and is paid on rent. All the funds received by the seller are either deposited or are reinvested in similar projects. The rental rate is 5% of the capital value. The landlord costs are 2% of the capital value and are paid by the buyer when using rent and buy. The period is 65 years. 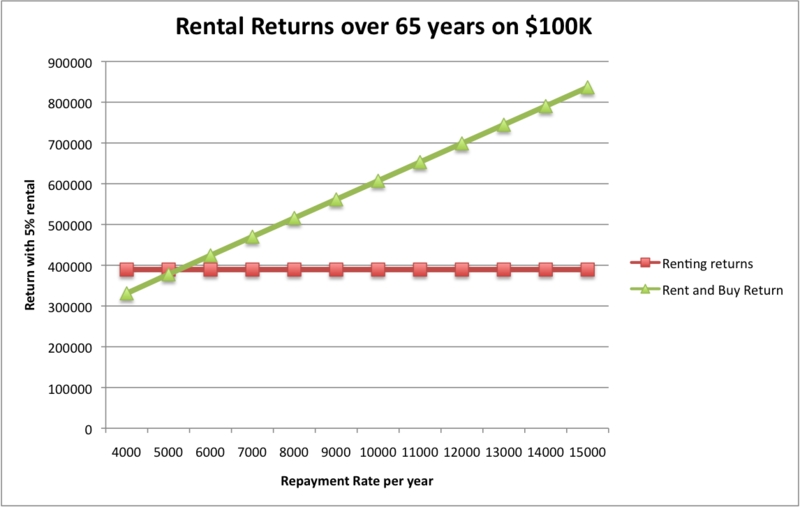 Under these circumstances, Rent and Buy is always better for the investor than renting if the repayment rate is greater than the real rental cost. With rent and buy running costs are covered by the buyer not the investor and tax is deferred until the capital is repaid. Rent and buy mean investors prefer a rapid repayment of capital because they can re-invest their rental payments and start to compound their investments. Both buyers and investors are financially better off with rent and buy than with the alternatives of loans for buyers and owning a whole property and renting for investors. Both buyers and investors can sell their agreements to others without having to sell the dwelling. This makes the agreements a liquid investment for both buyers and sellers. In turn, it makes the market in homes accessible to more people. The dwelling market is currently funded almost exclusively through loans and homes are relatively illiquid. Agreements can be amalgamated or split. The approach can be used by large investors or by small investors. The cost to purchase a dwelling is related directly to its rental value and is predictable. Both buyers and investors have inflation protection. Rent and buy combine several components each of which already exists independently. The innovation is to bring all these together into a single system. One component is that loans are not used to facilitate a transfer of ownership. Rather ownership is transferred incrementally through a shared equity arrangement. The shared equity arrangement means that the value to both buyers and sellers is related directly to the earning potential of the asset or its rental value. Another component is that the shared equity is structured so that the shared equity parts can each be purchased and sold independently of the dwelling and the other parties to the transaction. The system continuously monitors the ability of the renter to continue to pay rent. There will be systems to keep track of the running costs of the dwelling so that renters know the total costs. The system calculates the rental liabilities and returns on investments. All payments and transfers of money are recorded and stored by the system. Both buyers and sellers will have a record of their reliability and actions with previous sales. In effect, the Rent and Buy agreement is a combination of a rental agreement and a mortgage agreement. The Rent and Buy system will charge an administration fee of 1% of the capital value paid each year. It will cover mortgage risk and may include home insurance.